Recall a moment from your life when God felt very close; when you had a powerful experience of God’s presence. It might have taken place at home, at work, in church, in a classroom, on a retreat or in nature. What do you remember of the experience? How old were you? Where were you? Did it involve others? What gift did God give you in that experience? The great feast the Church celebrates — the Body and Blood of Christ — places great importance on memory and invites us to remember all the things God has done for us, especially what God has done for us in Christ. Each time we celebrate Mass, we gather to remember. This helps us to avoid what Pope Francis has called “spiritual amnesia.” When we have spiritual amnesia, we lose our memory of our personal salvation history and our “first love” with the Lord. When we have spiritual amnesia, we forget who we are and to whom we belong, and other things can begin to replace a living relationship with God. In the Book of Deuteronomy, Moses exhorts the people, “Remember!” (8:2-3, 14-16). “Remember how for 40 years now the Lord has directed your journey.” Moses says to the people, “Do not forget! Do not forget the Lord, your God, who brought you out of the land of Egypt.” You faced dangers in the desert, and God directed your journey. You were thirsty, and God provided water. You were hungry, and God fed you with manna. For many years, when I heard “Do this in memory of me,” I thought of it simply as a commandment to reenact the meal, to have Mass, and to do it often. That is certainly part of it. But Jesus is also saying: I have been blessed, broken and shared. I have given my life for others. You, my disciples, must also be blessed, broken and shared. Imitate me. Offer yourself to others. Love others as I have loved you. This memory, made present in each Mass, is demanding. It took Jesus to the margins of his society and religious tradition where he loved and showed welcome to outcasts and sinners, and it took him to the cross. Who in your life is a witness to a life blessed, broken and shared? Who offers themselves generously to others? There are so many ways that disciples imitate Christ in this kind of generosity: in the gift of self to family, a partner, children, other loved ones or a friend; in a job or career; in the works of mercy and other acts of kindness done quietly and humbly. At the same time, how are we called to greater love, generosity and sacrifice in memory of him? Here’s one thought: What bothers your conscience at work, at home, in your neighborhood or in our church? What do you want to do but don’t, because it seems too big to tackle or too big of a personal risk to take on? When we take that first step, the God who has always been faithful to us will be with us. Remember what God has done for you, for us. The God who has been powerfully present in our lives. The God who frees us, loves us. The One who comes to us in bread and wine to nourish us, to give us life, at each Mass, and always. Note from the editor: This blog post is a version of a homily that Fr. Luke Hansen, SJ, preached at the Church of the Gesu on June 18, 2017 (Solemnity of the Most Holy Body and Blood) in Milwaukee, Wisconsin. 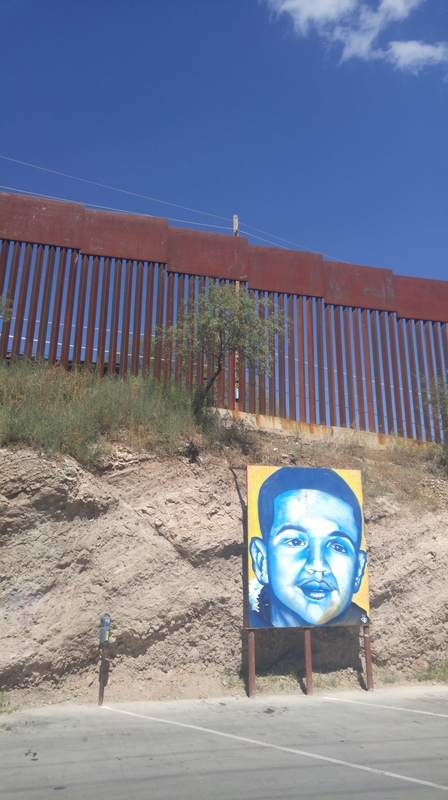 Last month, I attended Mass at the border; I was part of a community of believers uniting around bread and wine miraculously made into flesh and blood. I was on the Mexican side, sitting on a concrete street curb next to another Catholic sister. Together we were a color pop in the assembly: we stuck out in our bright turquoise T-shirts declaring “Catholic Sisters for Compassionate Immigration Reform.” Nearby sat our friend, Br. David, a Franciscan Capuchin, bearing witness in his dusty brown habit. Guests to this area, this Mass we were attending coincided with the events of the School of Americas Watch Border Convergence throughout the entire weekend. 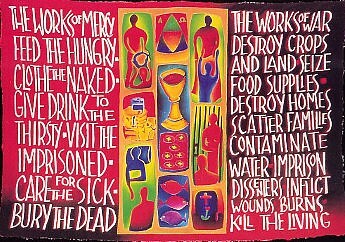 Messy Jesus Business Rabble Rouser, Amy Nee-Walker, recently wrote the following Scripture reflection “Being Bread for Life: A Sacrifice Pleasing to the Lord” for the Nineteenth Sunday in Ordinary Time and posted it on the Catholics On Call blog. In today’s readings, John the Baptist is prodded past the point of despair through miraculous nourishment in the desert, St. Paul exhorts the church in Ephesus to be “imitators of Christ,” who, as Jesus iterates in the Gospel of John, is “the bread of life.” Meditating on these readings on August 9th 2015, I am moved by how poignantly they contrast to the events that happened on this same date, 70 years ago. In a new book, Nagasaki: Life After Nuclear War, Susan Southard further personalizes the story of those who suffered through and survived the massacre at Nagasaki by focusing on the lives of five Hibakusha (the name given to survivors of the bombings). She tells of Taniguchi Sumiteru who, at the time of detonation, was a 16-year old boy, riding his bicycle to deliver mail throughout the city. The bomb destroyed over three square miles of the city in which Taniguchi lived and worked. It was 17 months before he could sit up, having had the skin melted off his back and arms. Because of lying face-forward in bed so long, his chest too began to rot away. After four years Taniguchi was finally discharged from the hospital. As doctors and nurses did the excruciating work of repairing his body, he is reported to have cried out, “Kill me, kill me!” preferring to die than to endure the pain any longer. As I read the lament of Elijah in the wilderness, “This is enough … take my life!” I hear the wails of young Taniguchi and those who thought it better to have died than survive the pain of their injuries or the turmoil of radiation sickness and cancer. Yet, just as Elijah was ordered to eat and endure for the sake of those who remain, so the Hibakusha, like Taniguchi, endured their bodily and emotional trauma and engaged with life that they might be representatives for those from whom life was irrevocably stolen. Nuclear weapons, and the radiation they emit, wreak havoc on bodies, poison waterways, and seep into the soil, sowing seeds of destruction for generations. It is a death that strikes heavily and spreads deeply, infecting the sources of life for the present and the future. The U.S. is the only nation that has used nuclear weapons as an act of war and continues to be a leader in nuclear munitions and in further development of nuclear armament and technologies. “All bitterness, fury, anger, shouting, and reviling must be removed from you, along with all malice. And be kind to one another, compassionate, forgiving one another as God has forgiven you in Christ. This Christ, very much a man with all the fears and pains that accompany life within the flesh, willingly proclaimed himself as “the living bread that came down from heaven.” “The bread that I will give,” he said, “is my flesh for the life of the world.” In this, Jesus fully acknowledges that to give bread for the nourishment of life in the world would come at a personal cost and he was willing to give it, sacrificing even his own life. What does it mean to be followers of one who rejects self-preservation, one who would choose that his own body be broken, his own flesh be consumed for the sake of giving life to others, rather than ever being an instrument of harm? Elijah, after being roused from despair, continued to be a prophetic voice in the name of God. The Hibakusha bore the trauma of horrific wounds and unhealable memories and went on to be a voice for those who lost their lives as well as a healing presence for those who survived. Jesus overcame death by willingly accepting it so that we all might discover the way to peace and to life abundant. How do we walk on amidst these truths? For today, I sit in prayer with the presence of the Spirit; I hold the generations who suffer from reckless, destructive war-making—as well as those who suffer from my own careless interactions and complicity in social evils—in my heart. I ask that I might be transformed and become a true image-bearer of the compassionate, forgiving, nourishing, healing Christ. Broken by our pain and suffering, broken by injustice, broken by the Truth. 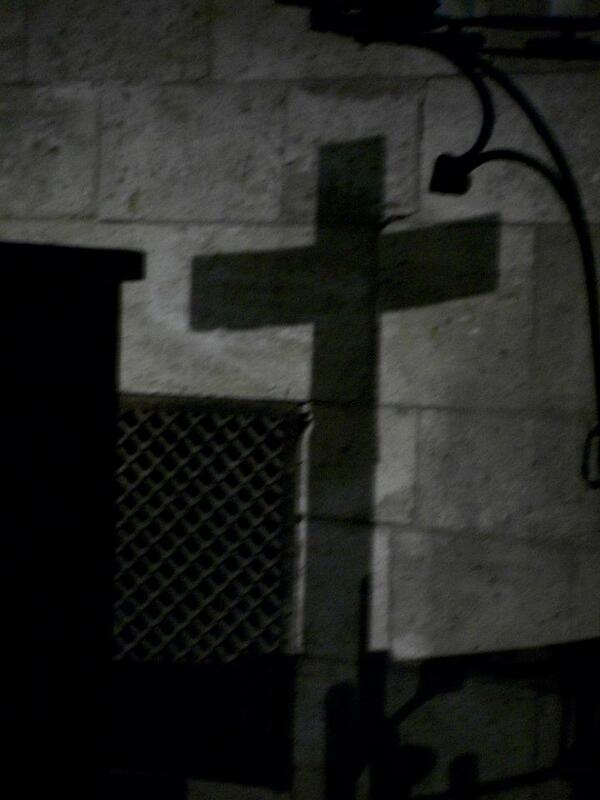 The activities of Lent help me encounter my brokenness. Or, more like, confront my brokenness. I am tuned into social injustices in a great volume. In particular, I am praying and thinking about poverty and hunger a lot due to the nature of the CRS Rice Bowl and the Food Fast I helped with last weekend. And, I am getting more real with myself about my needs for real repentance. I am weak, I am a sinner. I am so far from perfect that sometimes it’s hard to believe I am a child of God. The Truth is, Jesus was broken too. Right — he was not sinful, of course, but he certainly experienced pain, suffering and dependence on his Father for wholeness and completeness. We depend on Jesus to be whole, healthy, and holy. Living a Eucharistic life means we embrace our brokenness and acknowledge that our pain and brokenness is, amazingly, a blessing. Somehow, suffering is redemptive. And we get to know this through Christ. Our brokenness unites us with Christ, for Jesus is with us and knows suffering. Just like the Eucharistic prayers say, Christ is blessed, broken and shared. This is the Bread of Life that nourishes us, strengthens us. We are also blessed, broken and shared through Christ, in community. Let us lean on each other and unite and heal. Let us open up to the graces only found in Jesus for the True freedom and peace that comes with trusting the mystery that our brokenness is truly a blessing. Soon we’ll be rejoicing with hope and joy, for we trust that Jesus is our redeemer. Yes, this coming Sunday is Palm Sunday, and we’re getting very closer to the celebrations of salvation on Easter Sunday. One of my Facebook friends recently posted a rant about mothers who show up late to and leave early from Mass. He stated that he has more respect for people who don’t bother coming at all: “Either be all in or all out.” Others chimed in with “Amens” and further complaints about the entertainment and food that parents bring to church for their children nowadays. Having arrived 10 minutes late to Mass that morning, library tote full of Dora books slung over one shoulder and a diaper bag with emergency snacks hanging on the other, I felt at once embarrassed and defensive. Part of me wanted to dismiss his vent outright: clearly, this was the naïve and uncompassionate perspective of someone who’s not yet a parent. He just doesn’t understand the monolithic venture that is Getting Out the Door with Little Ones, I thought to myself. After all, I had spent my entire morning trying to get to Mass on time… but two blowout diapers and a child who is absolutely determined to put her shoes on all by herself had conspired to neutralize my good intentions. Let’s see him do it any better, was my rather un-Christian reaction. Still, his words gnawed at me, probably because I have wrestled with the conundrum of kids at church since my daughter was born two and a half years ago. The fact is, children at Mass are distracting – to those around them and, most especially, to their parents. Prayerful reverence is not easily practiced with a fussy baby in your lap and a squirmy preschooler at your side. There have been multiple occasions in which, nerves frayed and feeling far less peaceful than I did before the start of Mass, I wonder if it was even worth it to attend. Yet something inside me always answers “Yes!” I believe there is value in attending Mass with kids… Even when it means enduring the walk of shame up to the only open pew (at the very front of the church, naturally) during the Gospel Alleluia, or spending the entire hour shushing and chasing my two-year-old, or willing myself not to engage in a glaring war with a man who disapproves of nursing in church. We as a family are rarely (if ever) “all in” when it comes to Mass: we are late or agitated or exhausted or impatient or poopy or hungry or a catastrophic mix of all these – but I have to believe that God appreciates our presence there despite -indeed because of – our very conspicuous deficiencies in piety. We are the Body of Christ: messy, flawed, unfocused… and beloved. My daughters may not be able to understand or participate fully in the Eucharistic celebration, and their lack of volume/impulse control may detract from others’ ability to pray as they would prefer. Still, they are vessels of a special kind of grace, and I believe that the Mass as a whole is better, not worse, because my girls are present. Their faith cannot be anything but childlike, and so it ministers in a way no polished homily can. 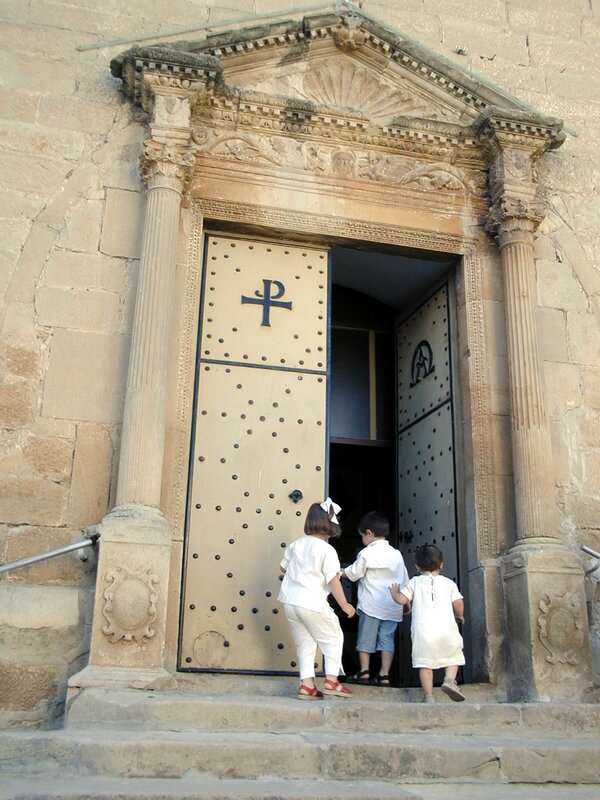 Once, as we shuffled in line to receive Eucharist, my daughter proclaimed loudly “Mama, there’s Jesus on the cross, and Jesus in Comoonin [Communion], and Jesus in my heart!” I know I’m not the only adult whose mind, in that moment, was called away from wandering thoughts and into reflection upon the sacred Mystery of Christ. Nicole Steele Wooldridge attends Mass with her daughters in the Seattle, Wash. area; she apologizes if, while doing so, her baby has recently spit up on your rosary or her two-year-old has scribbled in your prayer book. If it makes you feel any better, she probably hasn’t had a shower in a few days. 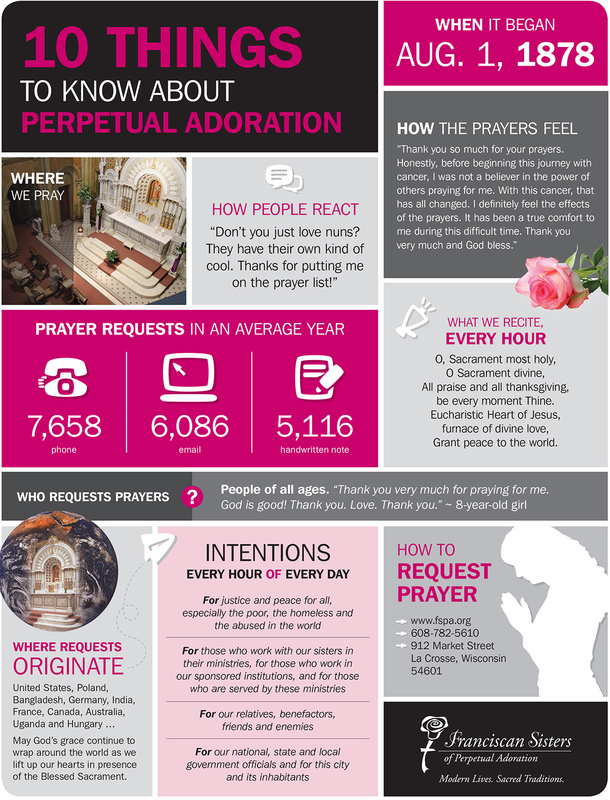 Today marks 134 years of Perpetual Adoration in my community’s chapel. I will never understand how Christ is present in the Eucharist. I don’t really want to understand. Mystery and wonder seem to increase my faith, somehow. What I know, though, is that Christ is present. I experience a hushing presence of God in our adoration chapel that causes me to be still and pray. It’s awesome and powerful. Thanks and Glory be to God! Amen! Amen! Church is tough. We are like a big dysfunctional family regularly squabbling and bickering about bizarre things. Sometimes we try to divorce each other or run away from home. But, we can’t, really. The Christian church family is the only family that can heal us and give us true freedom. In the Catholic branch, there’s true Eucharistic Love. No matter what, like it or not, we’re in this together. And no one can really separate herself from her roots; we can’t really forget who we are and where we belong. No one can really leave his family. In this family, our connection is Christ. Christ is the heart that keeps beating and keeps the energy flowing. Christ keeps us moving and building and creating. All the diversity is essential for the body to function. Let’s love and cherish it. We can’t persist; we can’t exist without being different. God designed us this way on purpose. I love being Catholic because we’re a wide Church with a very deep spirituality. (At least that’s the way I understand Ecclesiology.) There’s a wide range of what makes one Catholic. Despite our diversity, we still unite in Christ through the same sacraments, the same traditions and basically the same liturgies. In this family, we don’t know all our relatives because we’re all so busy doing different work. It’s a little understandable. We are permitted to be different because we need to be. Part of the diversity of spirit means that we have different opinions about what our priorities should be. The challenge- and the frustration- is when we seem to lack appreciation for the others’ efforts in building the kingdom of God. We can’t all be working hard at every need. So why do those who are passionate about one issue get frustrated if others aren’t working at it with them? Personally, I have discerned that I am called to collaborate with peacemakers who are working for non-violent Gospel systemic change in the issues of poverty, war, torture, immigration, environmentalism and food. I depend on those who are working hard with the issues of health care, education, death penalty, abortion, contraception and equality to keep working hard in my name. No one can do everything. But we must all do something, right? Perhaps the most important thing we can do in these divided times is support each other. Truly we can never say thank you enough. There’s struggle and pain in our divided, yet united, beautiful diverse body. When we criticize each other, we so easily feel as if no one has noticed all the hard work we have been trying to do. I’ve noticed and I say thank you! Thank you dear bishops for working hard to keep us grounded in the traditions and doctrines that you value. Thank you dear pro-life activists for working hard for our freedoms to say no to things that are wrong and deathly. Thank you, dear sisters and brothers who are working hard to build equality and justice in our church. Thank you, dear friends who are putting their bodies on the line to end war, torture and violence. Thank you, dear sisters, for creatively raising consciousness and advocating tirelessly for legislation to help the poor and vulnerable. Thank you, dear elders who have dedicated your entire lives to the service of the church and poor. Thank you, everyone for all you do to build the kingdom of God! Coming to a Sunday near you, we can celebrate the gratitude. While we commune, look and listen for the resurrections and alleluias. You’re invited to a wild family reunion.